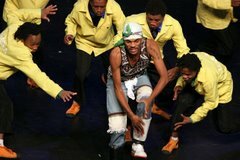 alfabet is the latest of numerous works to define theatre as an arena for cultural production in South Africa. Tossie van Tonder has been a creative movement director and mostly solo performer since 1980, exploring rites of passage and autobiographical exposés through the larger medium of theatre. Her work addresses the creative embodiment of life experiences. Dialogues through movement, voice, engagement with objects and group work, facilitated to enhance and give form (‘per form’) to the individual’s position in the world today---theatre as survival. She also conducts work and artistic processes for theatre companies as well as non-artistic groups. 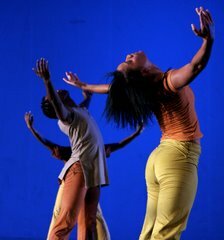 In November 2006 she directed and performed with Remix Dance Project on the production of bluebeard. This is a work of startling and stark beauty, retelling the cruel legend of Bluebeard. Unfolding in the world of metaphor and symbol, bluebeard is about HIV/Aids and other naïve contracts with a dangerous partner. Able and disabled dancers embodied today’s unthinkable yet liveable reality with the immediacy of struggle, innocence, illusion, emotion’s ambiguity and baleful pronouncements of intimate violence----trans-gendered as much as trans-generational : A story for Europe, Africa, the Lion’s Den on the slopes of Devil’s Peak where the site specific performance took place. In September 2006 she participated in Out The Box Festival of Puppets, Masks and Visual Performance Africa Focus with POPPE, a solo performance, albeit with 20 participants in an expanded experiment with “a puppet loosing her selves (of strings) and relying upon sentient breaths of witnesses to bring about the most exaggerated expression in a state of emergency”. POPPE allowed for the moving body (the ultimate essence of a border) to bracket the beginnings of one’s self up till the chaos of one’s strongest feelings. Earlier in 2006 she co-directed Orfeus with theatre director Brett Bailey. In 2005 she performed the intricacies of the mother-child relationship with her son, as a celebration. 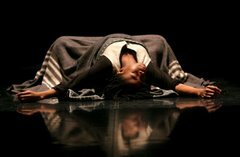 Tossie van Tonder is currently exploring the philosophy of the female body as theatre for the production of alfabet commissioned by FNB Dance Umbrella Festival 2007.
alfabet is an autobiographical portrayal of a life lived in and through the female body in ceremony. It attempts to express nature in the dead crone, the woman, the maternal body and a girl-child, as memory and as image. The progress from death and her (r)evolution beyond birth shows how the things that one loves, lives, and dies cannot frequently be expressed in words, but can be enlivened by refusing words, inviting the body to act as sovereign agent of knowledge and being, through movement and voice. alfabet bears across that which we know instinctively but have forgotten, not because of its diminished presence, but because of its power and threat should it be, or not be accessed. This multi-genred work hopes to bring an uncompromising strategy that invites the audience to read the female body as an alfabet in her own right. It hopes to expose the aesthetic mystery of the unrest of a woman under the patriarchate.